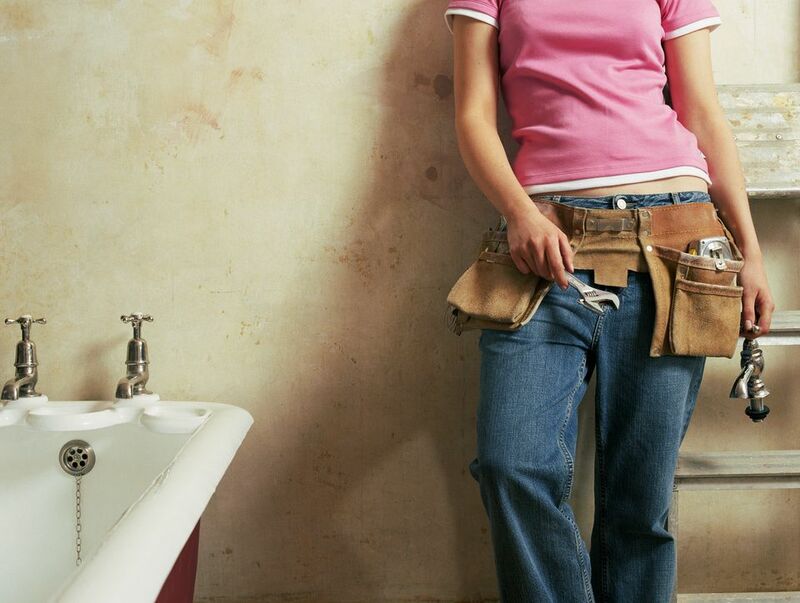 While professional plumbers drive around with plenty of specialty equipment on their trucks, homeowners can handle more of their own needs with just a handful of plumbing tools. This is because the most common household plumbing repairs are more about the know-how (and replacement parts) than about advanced tools and special techniques. But there are a few specialty items that are indispensable for everyday plumbing jobs. Topping the list are those for the most familiar plumbing problems of all: clogged drains. A sink auger (also called a drum auger or canister auger) is the ultimate weapon for breaking up and clearing clogs in sink and tub drains. Just don't use it on toilets—they call for a closet auger or toilet auger (see next slide). A sink auger consists of a flexible stainless steel cable with a corkscrew tip at the end. The cable is coiled within a drum canister and is extended into a drain to reach a clog and clear it. The drum has a handle, and there's a thumbscrew that locks the cable to the canister, and when you insert the cable into the drain and turn the handle, the rotating drum snakes the cable through bends in the drain pipe, allowing the cable tip to penetrate clogs and pull them out. The toilet auger (also called a closet auger or water closet auger) is used to clear clogs in toilets. You do not want to use a sink auger for toilets, or toilet auger for standard drains, as the tools are designed for very different purposes. A toilet auger has a long metal rod with a bend for reaching into the hole at the bottom of the toilet bowl. A rubber sleeve covers the bend to protect the porcelain in the toilet from being scratched. Once the tool is in place, you push and rotate the auger cable to snake it into or through the clog. The flange plunger, or ball or toilet plunger, is a specially shaped plunger used to clear clogs in toilets. It works like a regular plunger but has a flange—an extended rubber flap below the dome of the plunger head—that helps seal around the hole at the bottom of the toilet bowl. With the bottom opening sealed, the plunger can effectively create the hydraulic pressure necessary to dislodge most clogs from a toilet. The cup plunger may be the most common plumbing tool in the home. It has a rubber cup-like shape and a wooden handle and is used to clear clogs in sinks, tubs, and showers. Do not use this plunger for clearing toilet clogs; that requires a specially shaped plunger called a flange plunger (previous slide). Some flange plungers, though, can be used as standard cup plungers when the flange is tucked up inside. Plumber's tape is an essential material for preventing leaks at threaded plumbing connections. Often called Teflon tape (although it's not made with Teflon-brand material), plumber's tape is a thin white tape that you wrap around threads on pipes and fittings before twisting the parts together. It adds a bit of lubricant to aid threading and also helps to seal the joint to prevent leaks. Made with PTFE (PolyTetraFluoroEthylene), it is silky in texture and is sold in small rolls. Channel-type pliers are commonly known by the brand name Channel-Locks, and are also known as slip-joint pliers.They're similar to regular adjustable pliers but have extended adjustment sections as well as angled jaws, allowing you to grip pipes or other plumbing parts of almost any size. The long handles provide tremendous leverage for squeezing and twisting. You can use them to grip heavy steel pipe or to gently tighten large plastic nuts on sink drains. If you own only one specialty plumbing tool, this should be the one. An adjustable pipe wrench is the quintessential metal plumbing tool. It provides tremendous leverage and grip. It is designed to grip round objects (such as pipes) securely by digging its sharp serrated teeth into the pipe with increasing pressure as the wrench is turned. A pipe wrench leaves teeth marks behind and is not recommended for removal of shiny fixtures or for small or fragile pipes, like copper water pipes. Pipe wrenches are primarily used on galvanized steel and iron pipe and on heavy-duty fixtures with rough finishes, such as outdoor spigots or hydrants. A faucet valve-seat wrench is a simple tool used to remove the valve seats on a compression faucet. Compression faucets, the oldest style of faucet, work by compressing a rubber washer against a valve seat in the faucet body. When the washer wears out, the valve seat can become damaged and rough, preventing a complete seal. When that happens, you can remove the valve seat and replace it, using a valve seat wrench. If the seat is not removable, you must regrind it to a smooth surface using a reseating tool. Faucet packing and rubber washers and O-rings are lifesavers for fixing leaky valves on sinks, radiators, and other old or traditional equipment. Packing is a graphite- or wax-coated string that you wrap around valve stems and pack under packing nuts to create a watertight seal. Rubber washers and O-rings are sold in variety packs containing several different shapes and sizes. If you're fixing an old faucet and can't find an official replacement part at the store, a variety pack well have the part you need. It's handy to have one around because it might save you a trip to the store. The tubing cutter is an essential plumbing tool if you're working with copper pipe. Copper requires clean, square cuts, and tubing cutters do just that—with much less effort than a hacksaw. It has a thin cutting wheel that cuts the metal and a flat pressure wheel that applies pressure when you turn the tool's knob. Clamp the tool onto a pipe and rotate it around the pipe, tightening the knob after every two or three rotations. The cutting wheels gradually cut through the material. After making the cut, remove the burr on the inside of the pipe, using the de-burring tool (a triangular metal piece) that is fitted to the body of the tubing cutter.